Best location in town, the hotel is in the middle of the city close to everything. The room is very quiet, very clean with a very very confortable bed. The swimming pool is very clean et beautiful. The breakfast is just wonderful, you can have international product as well as some local products. Food and beverage is menu is just perfect local and international dishes. I love it!!!! Most of the staff is so so professional and so welcoming. I recommend this hotel!!!!!!! The quality of the rooms is good. The pool area is excellent. Most staff are well trained. This 5-star hotel is located in the Bamako, less than 3 km from the National Museum of Mali. It features spacious air-conditioned rooms, tennis courts and an outdoor swimming pool. Rooms at Hôtel l’Amitié Bamako have a flat-screen TV and a balcony with a view of the city or river. The bathrooms are equipped with bathrobes, slippers and toiletries. The hotel provides free Wi-Fi throughout the hotel. 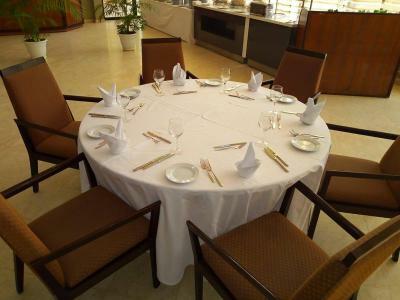 The hotel features two restaurants; La Table du Chef which serves gourmet French cuisine, and Le Djoliba, which specialises in local African dishes. A buffet breakfast is provided every morning or guests can choose to have breakfast served to their room. This spacious suite has its own dining area and kitchenette.